The Federal Road Safety Corps (FRSC) has said that drivers in the convoy of top officials of the Kogi State Government had refused to attend training programmes organised by the road safety marshals for drivers of top government officials in the country. 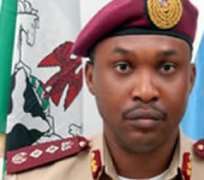 At the activities marking the 2013 Africa Road Safety and World Day for remembrance for road traffic crashes victims on Thursday in Abuja, the Corps Marshal and chief Executive of FRSC, Mr. Osita Chidoka, blamed the frequent road crashes involving top officials of the state on unqualified and untrained drivers. He recalled the Tuesday accident where the convoy of the state Governor, Captain Idris Wada was involved in an accident that led to the death of a former President of the Academic Staff Union of Universities, Prof. Festus Iyayi. Chidoka, who said that the FRSC had commenced investigation into the fatal crash, added that the outcome of the investigation would be made public. He said, 'Unfortunately, the Kogi State convoy drivers have not been involved in this training. I've just been told by the Sector Commander that the governor had asked him to take all the convoy drivers from Kogi State for this training, because, Kogi convoy drivers were not involved in this training. 'Of the 700 convoy drivers we trained in the last two years, none of them has been involved in any road crashes. The only crash we have seen so far from convoy are from people that have not attended our training. 'There are some vital things they were taught on how to move on convoy. So, now that the governor had directed his people to be trained, we have also advised him to bring some FRSC officials into his convoy because many of the state governors who have had no crashes have FRSC officials in their convoy. He said, 'You will recall that on December 28, 2012, the Kogi governor had a crash, in which his ADC was killed, on September 30, 2013, five people were injured in the deputy governor's convoy crash and also on November 12, 2013, the Kogi governor's convoy was involved in the second crash.' - Punch.